Zyrtec is a medicine that regulates level of histamine in human body. Histamine causes sneezing, itching, watery eyes, and runny nose. As antihistamine, Zyrtec reduces histamine and eliminates or diminishes allergic reaction ( sneezing, itching, watery eyes, and runny nose). Zyrtec is capable to treat symptoms of hay fever and to treat cold or allergy symptoms. Zyrtec may initiate slowness of thinking or slowing down all other reactions. Therefore caution is advisable when driving or doing anything that requests attention and awareness. Drinking alcohol escalates some of side effects of Zyrtec. If using other medications that also reduce your concentration or using medications for sleeping or medication treatment for either the seizures or depression or anxiety caution is advisable. Headache, exhaustion, weakness, sleepiness, which is associated with dosage, are primary side effects that involve nervous system, besides them there are dizziness, insomnia, nervousness. Nausea or even vomiting, dry mouth, dispepsia, pharyngitis, and increased appetite are the gastrointestinal side effects. In case of suspension of cetirizine there is an opportunity for malfunction of liver or chronically acute hepatitis. Sporadic cases of heavy breathing, coughing, bronchitis, sinusitis, and asthma are side effects of the respiratory system. Maculopapular and urticarial eruptions involving cetirizine are dermatological side effects. General side effects considers epistaxis and accidental injury. Hypersensitivity side effects have included a case report of an anaphylactic reaction. Side effects are usual with usage of any medications, but when using Zyrtec and some of these unexpected results happen see your physician right away. Lethargy, dry mouth, stomach pain, tiredness, insomnia, acute allergic reaction like rash, hard breathing, swelling of the mouth or face or tongue, itching, dark urine, unusual bruising or bleeding, or if your eyes or skin becomes yellow these are the signs to seek for immediate medical help. Following the prescription given by the doctor or one on the label, and avoiding consummation dosage larger then prescribed. Zyrtec may be taken with or without food. If taking liquid medicine strict measuring is very important. 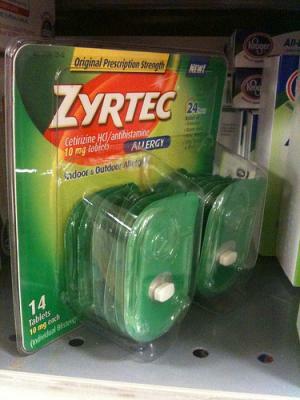 Do not use Zyrtec if it is not properly stored. If one dose of medicine is skipped it is better to wait until next dose and skip that one. Do not take medicine to catch up missed dose. In cases of possible overdosing seek for urgent medical help. Important is to avoid using Zyrtec with other medicament which can strengthen sleepiness caused by Zyrtec. is it allergy or just a cold? What should I know about Allegr drug? Maybe Claritan can help me? What is the difference between loratadine and cetirizine dihydrochloride?